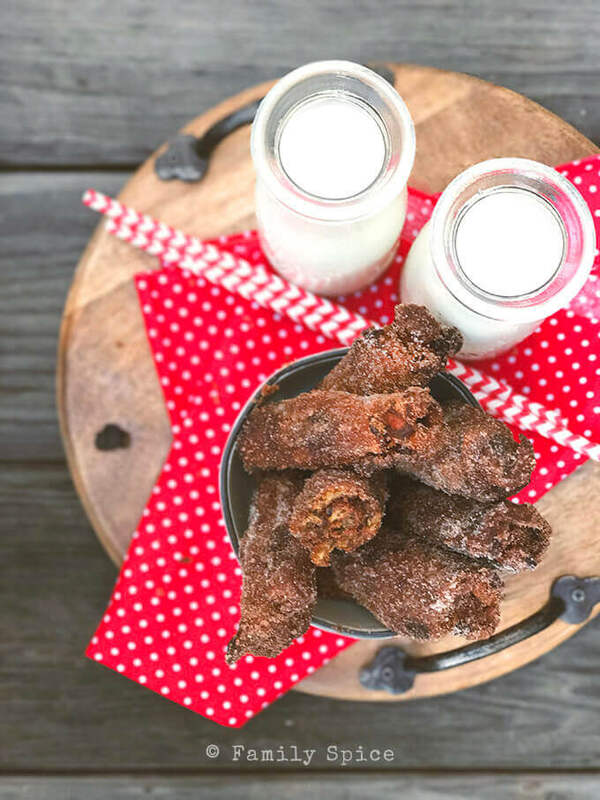 Although these may not be traditional Spanish churros, these chocolate raisin churros are much simpler and even more delicious! Sponsored by Sun-Maid Raisins. My daughter is now 12 and she is always begging to bake with me. I wish she had the same enthusiasm for cooking dinner or meal prep, but you can’t win them all. My boys also like to cook and bake. 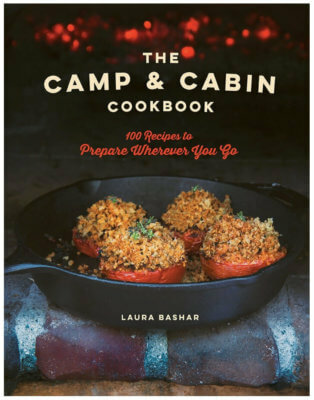 They certainly cook a lot on their Boy Scout camping trips, and their high school Spanish classes periodically require Spanish food for their presentations. So yes, my kids definitely know their way around the kitchen. My kids are also involved in the creative process, especially with food and meal requests. From fried ramen to empty-the-fridge-soups, I do my best to introduce new and sometimes strange new foods to my family. Some of our creations are duds, but then you get those gems where the kids talk about it for weeks on end and can’t wait to try it again. 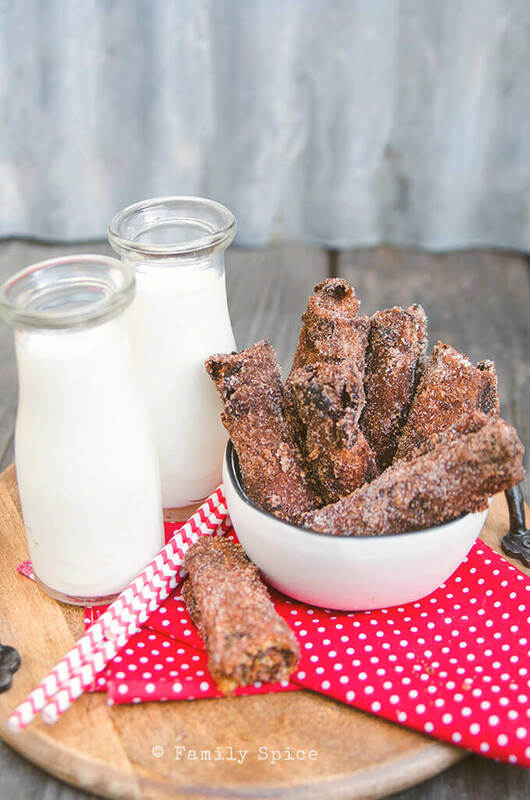 These chocolate raisin churros are one of those gems. And what’s not love? 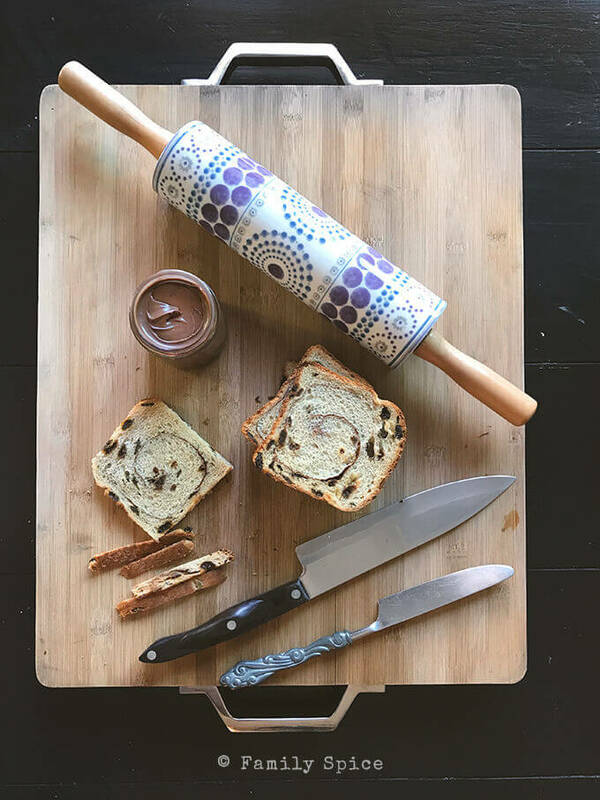 Chocolate slathered Sun-Maid Raisin Bread that’s deep fried and coated with sugar and cinnamon…. it’s a no-brainer. Now I know these are not authentic churros, I certainly can’t make these for high school Spanish class and call them authentic. But, they certainly carry the essence of the churro, fried “dough” covered in cinnamon and sugar. My daughter loved these so much that she offered to make them for my video. Those are her hands cutting the crust off the slices of raisin bread. And yes, her hands again rolling the trimmed sliced bread flat as best as she can. I had to curb her enthusiasm while spreading the chocolate hazelnut onto the bread and limit it to a thin layer, but other than that, my girl made these all on her own. And if she can do it, anyone can, too! Of course, I was in charge of the frying. Kids, open flame and hot oil don’t mix. But she had no problem rolling the fried “churros” into the cinnamon sugar mix. When they were ready, my kids did not care one bit if these were authentic churros or not. They were totally amazed and in love with these crunchy and insanely amazing sweet treats. 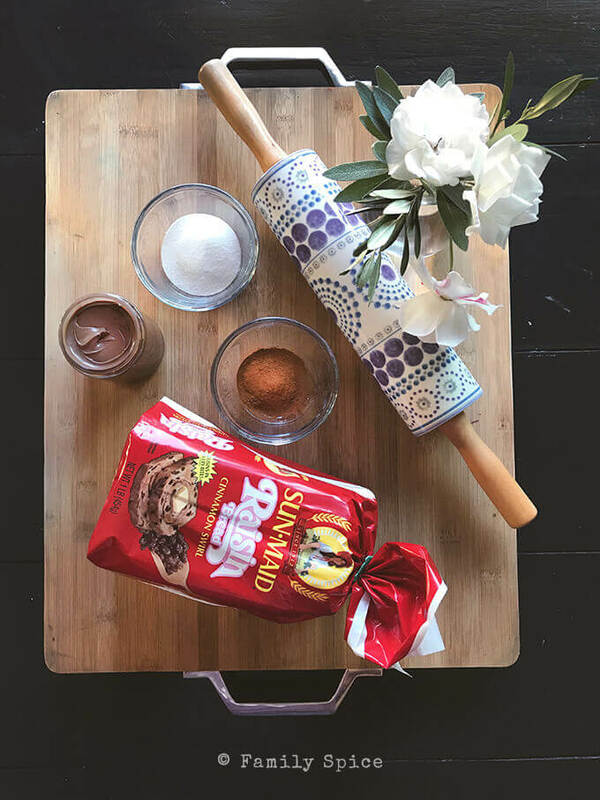 Although these may not be traditional Spanish churros, these chocolate raisin churros are much simpler and even more delicious! Roll trimmed bread slices with a rolling pin as flat as possible. Starting from one end, roll up the bread tightly and place on a plate, seam side down. Do this with the remaining raisin bread. Fill a small pot with approximately 1-1 1/2 inches of vegetable oil and heat to 350ºF/178ºC. Place two sheets of paper towels on a small baking sheet or plate. Using tongs, place up to two chocolate raisin rolls into the hot oil and fry until golden brown all over. The rolls might try to open up. Use the tongs to occasionally squeeze them shut while they fry. When browned all over, drain oil from each churro and transfer onto the plate lined with paper towels. Repeat with the rest of the churros until they are all fried. The oil will look a bit messy when you are done from the bits of cinnamon and chocolate, so you can not reuse this oil when done. Once cool enough to touch, roll each churro into the cinnamon-sugar and coat all over. Transfer to a serving dish and continue to roll the remaining churros into the cinnamon-sugar. What a creative take on churros! I love making churros! I can’t wait to try making this recipe! 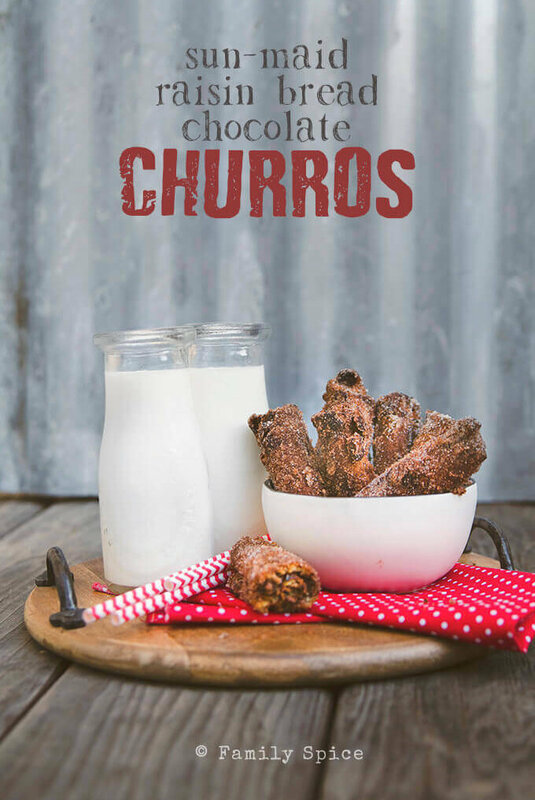 These Chocolate Raisin Churros looks amazing!